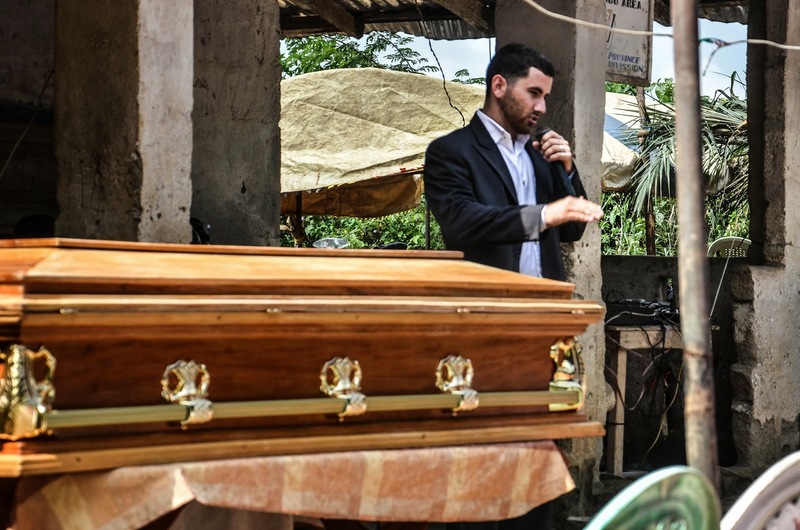 In Cameroon, we are constantly reminded of our mortality. Life expectancy, due lack of medical facilities, abundance of tropical diseases, AIDS, and highly stressful lives, is in the early 50s. When one reaches 70 years old, they are quite old here. Yesterday, I was invited to preach at the funeral of a brother in Christ, a preacher from Nigeria who has been in Cameroon for over 50 years. 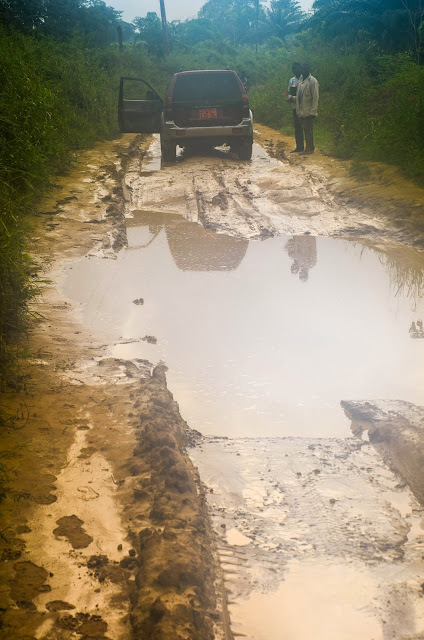 The Road to the village of Kongwe was a pretty bad- and we mistakenly took the worse one. Thankful for a 4x4 with good clearance. We did have the license plate come off because of the force of the water and the mud dragged it off, but got there. I was kind of afraid of flooding the engine, as this was one of the small puddles, but thank God we made it through- I was carrying along a couple of the Cameroon brethren. When they get worried, well you know it's a bad road. Preaching about living a life of profit. What are we going to care about on the day of our death? Our profit will not come from our possessions, our academic achievements, our prestige... they will come from the spiritual things in which we invest. What will a man give in exchange for his soul? 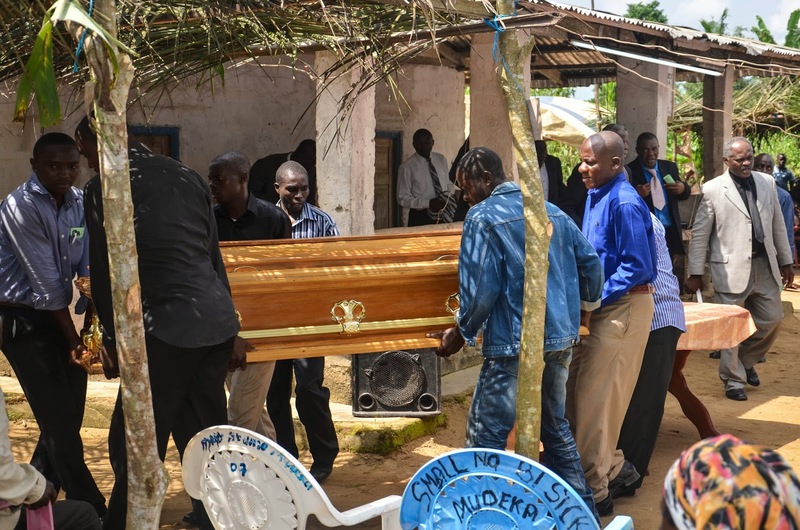 Carrying the Casket to the grave behind the church building. Just like that, our life can be carried away. This should not, for the Christian be a day of mourning, but a time of celebration. Final words uttered by Brother Vincent. I thank God for the opportunity to be part of this... it provokes much thought and reflection and reminds us that this life is but a fleeting shadow, here today and tomorrow we are gone. 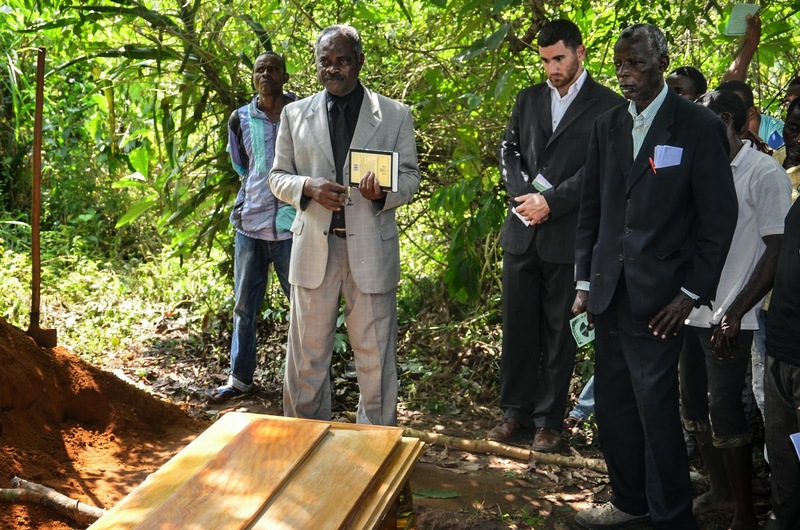 Lowering the casket into the grave Cameroon-style. 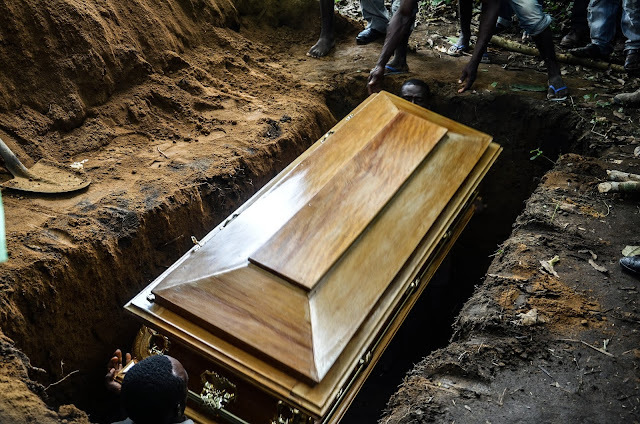 For dust you are, And to dust you shall return.” After a few close friends and relatives said their final goodbyes, the casket was quickly buried. Thank God that, for those in Christ, this is not the end... we shall rise again and be with our God. Maranatha Lord Jesus! 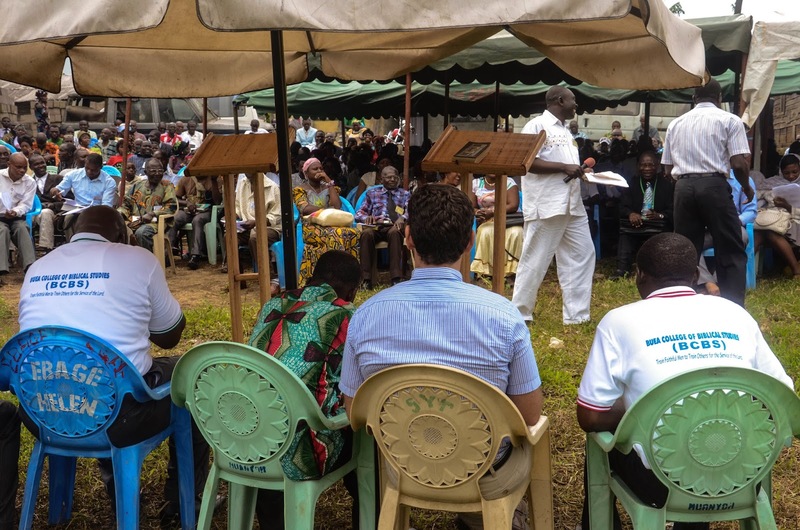 Since coming to Cameroon, we have been encouraged to be able to work with the Church of Christ here, to help to strengthen and build faith, and be part of their efforts as well. Last week, I (Jeremiah) had the opportunity to go to the town of Tombel, about 3 1/2 hours away, for the Annual Gospel Lecturship, a convention/camp for Brethren from all over Cameroon. There were over 300 people who came. 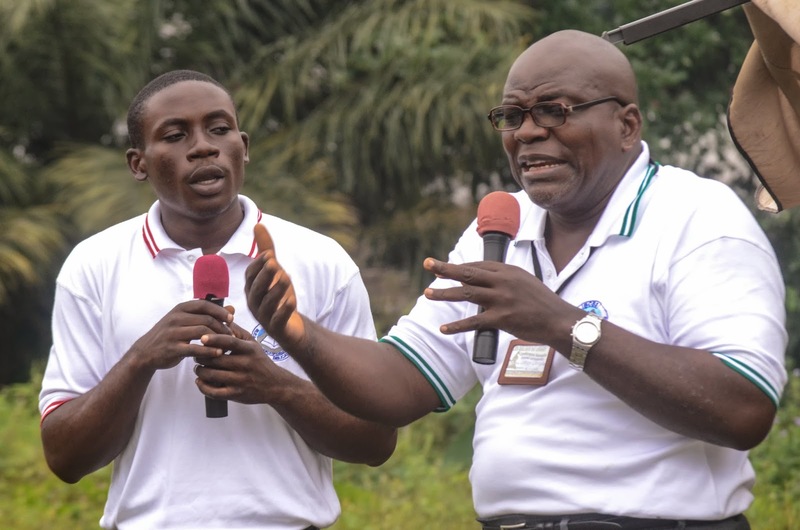 It was a time of good lessons, fellowship, prayer and encouragement, largely organized and funded by Cameroonians themselves. In the evening, there was outdoor preaching, in the afternoons, door to door evangelism. I was able to help meet 5 people who gave their names and phone numbers for the local brethren to follow up with Bible studies. Two good friends- Andy Leroy on the left translating into French, and Christopher Omam on the right preaching about Hypocrisy. It has been a blessing getting to know and work with these gentlemen. I was blessed to be able to help with Bible reading and say a few prayers, but what I enjoyed the most was the time I had for great discussions and to meet new people from all over the country. Sitting with 3 men I admire and enjoy- Christopher, Brother Tabe Moses, and Andy Leroy. 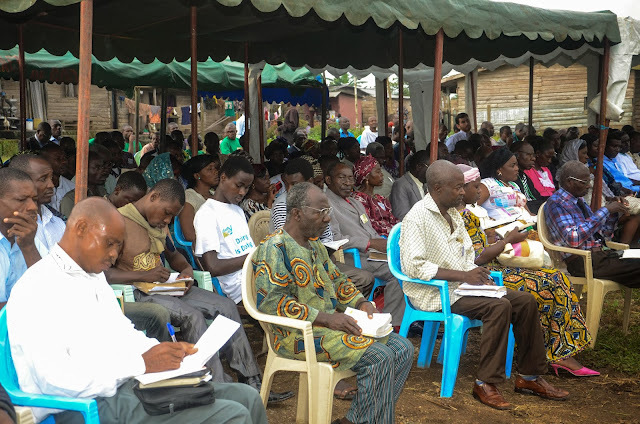 Some of the Buea Brethren (and Sister) who went for the lecturship. 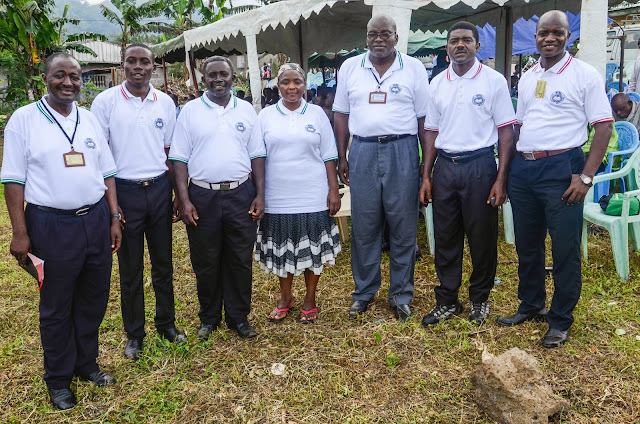 These are members of the Buea College of Biblical Studies. I really appreciate their faith and zeal for the Word of God and count them all as friends. One of the main reasons I went was to get to know these dear folks... Janet and Paul Kee. 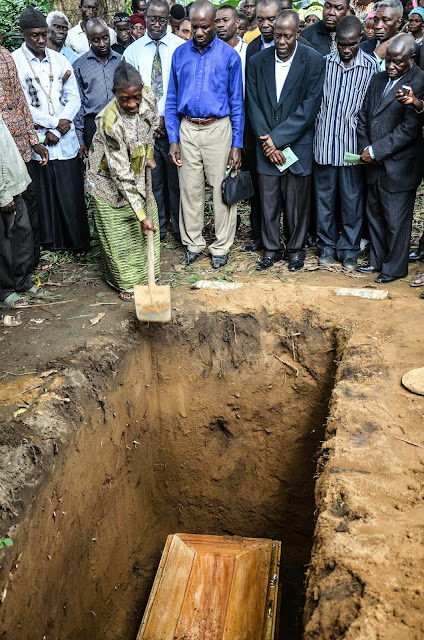 They have been in Cameroon for over 30 years. I was able to meet them at the camp, and it so happened that they were on their way to Buea the next day and so we had them over for diner. 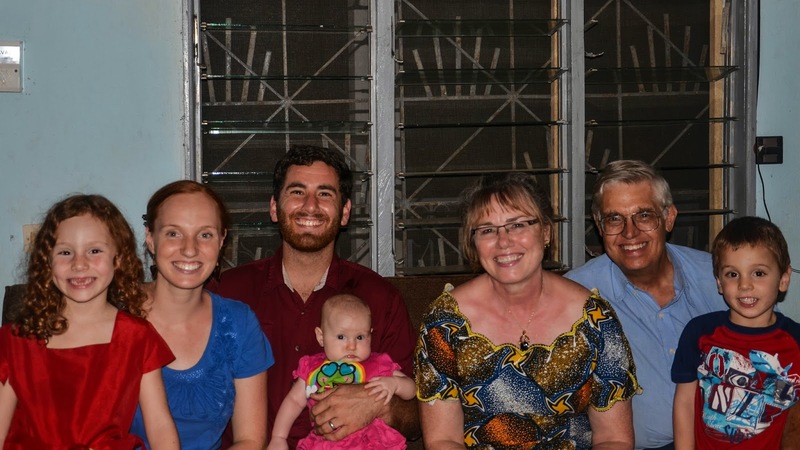 What a treat getting to talk to them, to glean from their experience and insight and to share with those who have raised their children in Africa, and sacrificed much to see the Lost become the Found. I was extremely encouraged by the Lectureship. We are planning next year to go as a family. While the church here has much growing still to do and much maturing, it is encouraging to see the efforts they are making and to be able to come alongside and help Equip, Empower, Educate and Evangelize; building faith and seeing God's transformational power do it's mighty work. Work to do in the Village of Maumu! 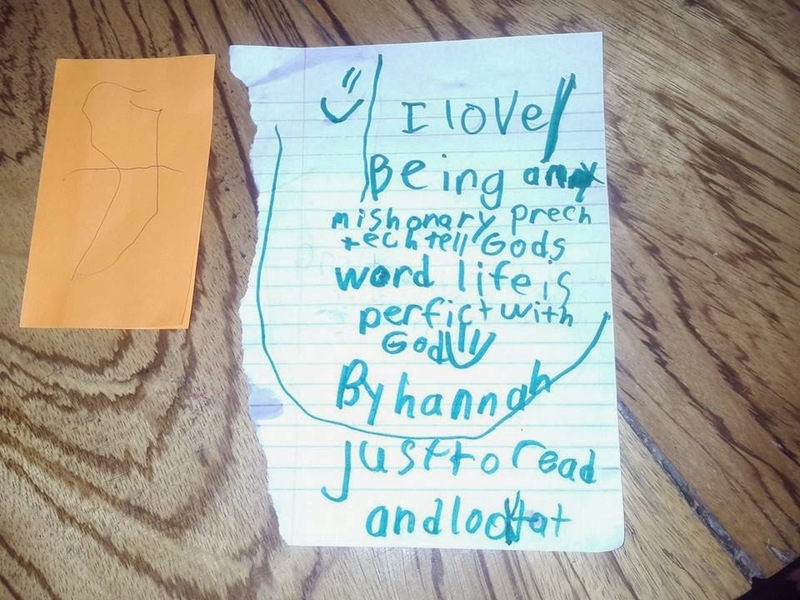 I love teaching Sunday School! It takes work but is lots of fun being able to help build a Bible foundation for these kids. They enjoy listening to Bible stories, singing songs, and doing crafts. So thankful for the folks who send funds and/or supplies to be able to do this. I'm excited that they put up an all natural bathroom recently (on the left behind Jonathan). Now we don't have to hold it until we get home. I must say Jeremiah is my favorite teacher and preacher. He follows the Bible, keeps the crowd's interest, and helps build faith. Here is an illustration on what happens when we try to do things on our own. But we can do all things through Christ who strengthens us. We have Power behind us. Here Jeremiah is helping the young boy have victory. A wonderful lady in the Church of Christ in Maumu brought these bananas from the farm to give to us. I am sometimes humbled by the people here. This bucket is cracked in half but they sowed it up and keep using it. On the right is a Cameroonian broom. A beautiful woman in the Church. On our way home...yes, we get to cross a river as we come and go! SO thankful for a 4 wheel drive vehicle to be able to do so. 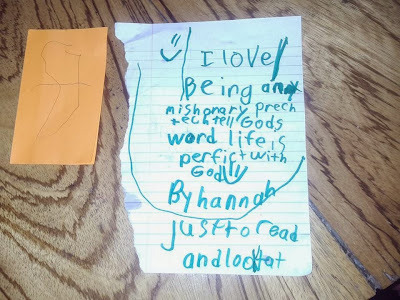 This is a note Hannah wrote today after coming back from the village.